With the super springy weather this week we've been gardening in the evenings after work. Monday night M. tilled new soil for relocating the strawberry plants and I transplanted our hollyhocks. While working I felt really motivated or excited to garden, to labor, to dig with a shovel. (I know, shocker, right?!) Perhaps it's because the winter was so drearily looong or because the spring weather is wooing me, I'm not sure. But for that moment it was a happy little realization. Also planted were liatris spicata and oxalis and on the to-do list are the ranunculus, anemone, and dahlia bulbs. Did I mention I've declared this the season of flowers? Our flower garden was so spare last year compared to our veggies, that I really missed them. 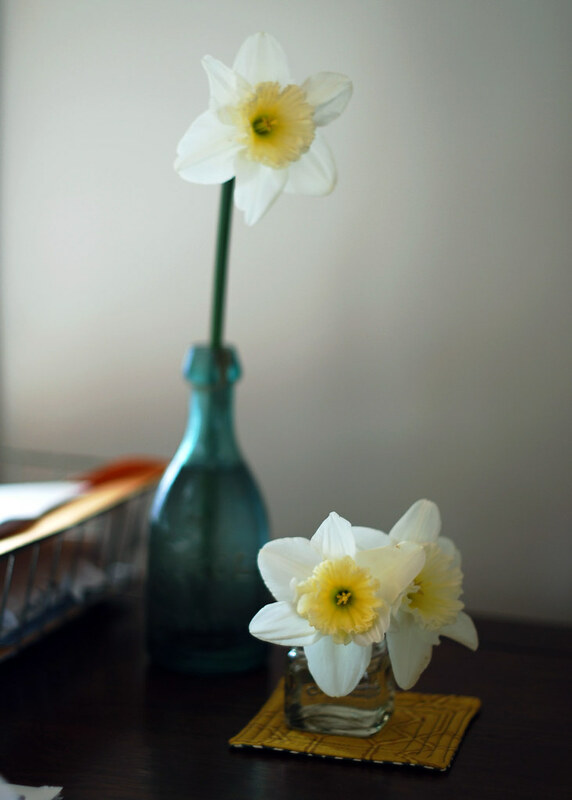 Current flower report: The daffodils are at the peak (have you noticed how fresh daffodils smell? ), forsythia began blooming Tuesday, the poppy seeds are sprouting, surprise lily leaves are getting tall, echinacea leaves are poking up and the daisies have spread like gangbusters from last year. This flower wallpaper is pretty and it's interesting the way change is integrated into the design of the space. Via all the mountains. The paintings of Bella Foster have an Alice Neel quality about them that I like. Are you planting flowers this season?